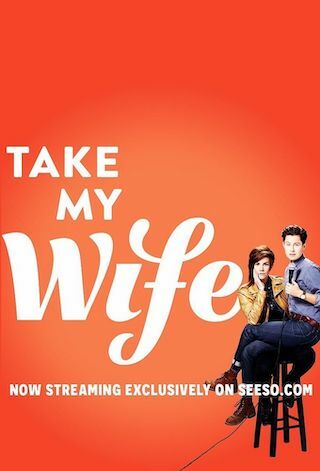 Take My Wife is a 30 minute scripted comedy television series, which kicked off on August 11, 2016, on Seeso and is broadcast every Saturday at . The show is currently in its 2nd season. Take My Wife is the story of Cameron and Rhea, playing fictionalized versions of themselves, two lady-identified comics who date each other. Rhea is working a graphic design job she hates and Cameron is fielding podcast questions about what it's like to be a woman in comedy. Big Jay Oakerson's What's Your F@%ing Deal? !